We've been getting a bit behind with the posts lately - what can we say, we've been too busy lounging in the sunshine eating tasty food. We've been in Cambodia for just over a week now and things are good. We arrived in the capital Phnom Penh last Monday evening and spent Tuesday recovering before moving on again. Well, Dgym spent the day recovering, I spent it trekking across town to visit both the genocide museum and the chocolate shop before we moved on again. Phnom Penh itself didn't exactly captivate us but nor did it live up to the horrible description on Wikitravel. (I'm starting to realise that because Wikitravel is the compounding of the experiences of everybody who's visited that place and bothered to write about it, and since people generally talk more about negative experiences than positive or neutral ones, it sometimes turns into a "list of bad stuff that could happen to you here but really most probably won't"). Sure, it's probably a bit dirtier than Bangkok and the traffic, while a bit lighter, is also a bit more insane and there's a bit more tuk tuk pestering but it didn't come across as rough or horrible, nor did anybody try to throw bricks at us. The rich poor divide is quite evident in the many huge shiny SUVs on the roads and big modern shopping malls while one-legged beggars get their children to follow you for entire blocks pleading for money. The riverside area is a very pleasant space and a nice place to sit, and there are some beautiful buildings and monuments. We stayed in an Irish pub along the river front which was OK but we couldn't eat one of those Irish breakfasts every morning. The genocide museum was - well, I don't know how you describe a genocide museum really. 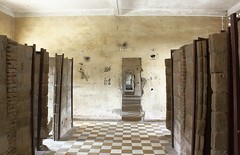 It's a former school which was converted into a prison camp by the Khmer Rouge regime in the Seventies. The four three-storey buildings are pretty much as they were when they were found by the Vietnamese after the fall of the regime - rusty iron bed frames remain in some of the interrogation rooms, other rooms are filled with the photographs that were taken of each inmate, and many rooms are divided into tiny cells by brick and wooden partitions. Barbed wire mesh remains across the front of one of the buildings - this prevented desperate inmates from committing suicide. It's worth reading about the Khmer Rouge rule and the Tuol Sleng Prison - very disturbing stuff but a piece of relatively recent history that has clearly had a huge impact on the country. The chocolate shop was considerably more pleasant, I met up with Dgym and we had a brownie and tried some of the pepper chocolate (pepper being one of those things Cambodia does well) and some chocolate coated coffee beans. Coffee is also one of those things Cambodia does well, and we're not complaining about the chocolate either. We thought maybe we'd end up getting the early morning boat to Siem Reap the day after that but I found a little booklet with some info about the quiet seaside resort of Kep which sounded lovely so we hopped on a bus and made our way down to the coast.